On St. Patrick’s Day, all sorts of recipes turn up for green cookies, green muffins, green candy, green everything except pasta. 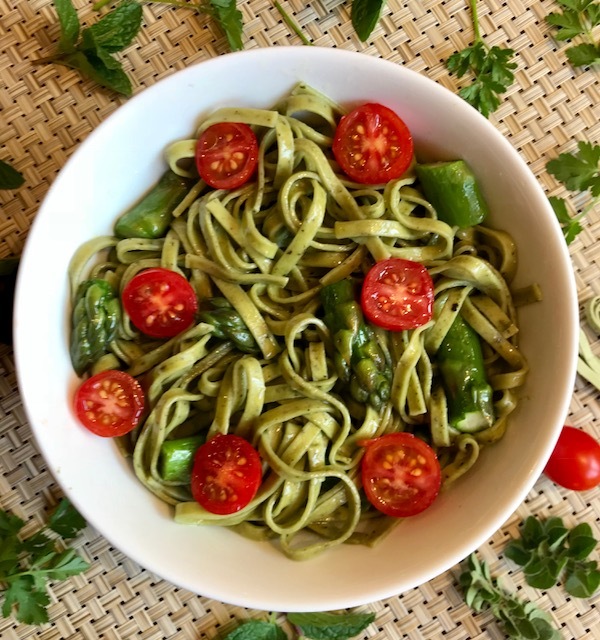 So how about making a nice dish of green linguine for St. Pat’s Day? 1. Set the cut asparagus aside in a bowl. 2. Meanwhile, bring water to a boil in a 4 to 6-quart sauce pot. 3. When water boils, add pasta and 3/4 teaspoon salt to the water. 4. Cook pasta according to package directions. 5. During the last minute of pasta cooking, add the asparagus to the pasta in sauce pot. 6. When pasta is “al dente” (crunchy-tender), drain the cooked pasta in a colander and quickly transfer it to a large glass or porcelain bowl. 7. Add the cherry tomatoes and olive oil. Taste and adjust salt and olive oil levels. 8. Serve pasta in individual bowls; ask guests to add grated cheese to their pasta bowls.